I LOVE me a good parable! They force us to sink in our roots deeper still. They force us to listen. There is so much MEAT that Jesus shares with us in this passage. But today, I want to focus on one small part of it. I know! It's painfully simple, but think about this. He scatters seed far and wide! God throws seed EVEN where the birds feast, EVEN where there are hard rocks and shallow soil, EVEN where the thorns can choke. Do you think it's because the Farmer is careless or wasteful? NO! It's because the Farmer is ever hopeful! He doesn't hold back or hold out. He doesn't prejudge the soil. He simply scatters seed, giving all a chance to take root. How about you, dear one? Are you scattering seed far and wide, hopeful for that rare flower that blooms even between the cracks in the sidewalk's concrete? Are you hopeful like our God? Or does the generosity of the Farmer with His Seed convict you as gently today as it's been convicting me all week? His generosity makes me wonder. 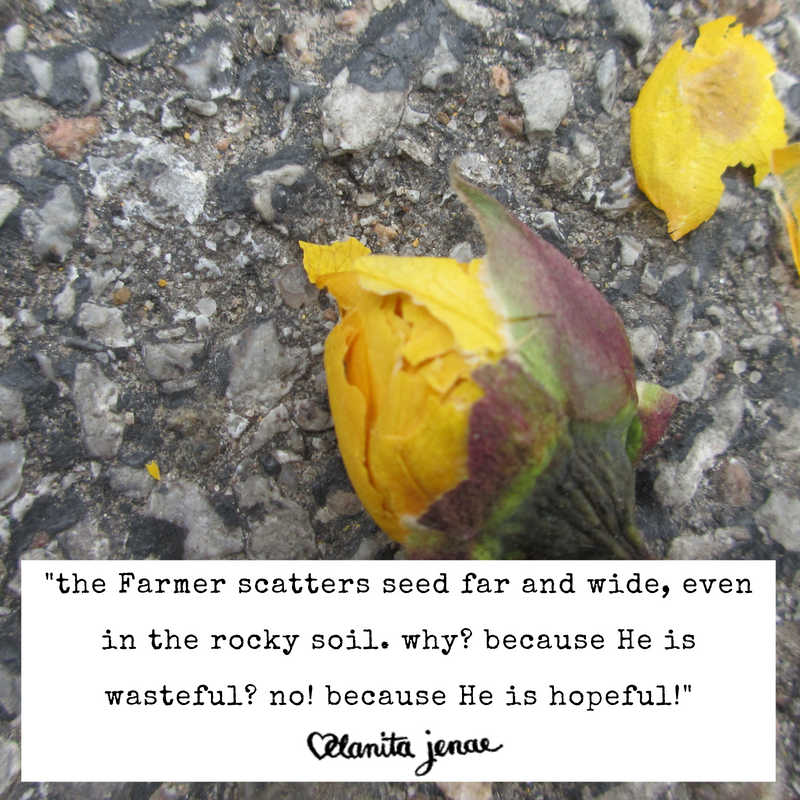 Are you only sowing seed on the ground that you know is fertile, that you know might produce a crop? Or maybe you don't want to scatter the seed because you wonder if the conditions or the seed itself is not just quite right? Will you wait another day? Or will you scoop up your life in your hands and share your testimony even though it may not be quite right yet? The truth is, we NEVER know who needs to hear what we have to share. We never know when a seed of encouragement, hope, or truth is going to take root. Our responsibility is not the harvest; it's in the sowing. So scatter the seed...and splatter the joy! Ask Him how He wants you to scatter seed in this season. Ask Him to help remove any fear of man or fear of failure that might be causing you to only scatter seed where you think the conditions are just right. I've been brainstorming this week simple ways I can scatter seed. Simple ways I can share His truths. If any come to your mind, please share them below.